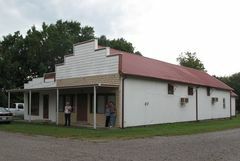 The story of the Soffietti-Boccia Store is one that represents the wider history of the Cherokee-Crawford coal field. In this store, which was active between circa 1915 and 1982, the Soffietti and Boccia families not only provided groceries, hardware, cloth, and feed, they provided a welcome contrast to the "company stores" owned by the various coal companies dominating the region. Where company stores exploited the miner, the owners of the Soffietti-Boccia Store went out of their way to support their customers and neighbors. 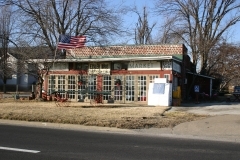 This customer base was comprised mostly of Eastern and Mediterranean European immigrants who arrived in Cherokee County seeking a better life than the ones they left in Europe. 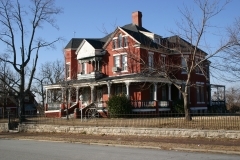 Clare and Glad Youse purchased this residence in 1927 during a period of rapid residential growth in Baxter Springs. They immediately began making improvements to the house and hired Joplin-based architect Truman Martinie to oversee the redesign. Its distinct full-height columns distinguish it as Neoclassical. Clare was involved in local mining interests at a time when the mining industry fueled development throughout Baxter Springs, southeast Kansas, and the tri-state area. He went on to serve as both a Kansas state representative and senator representing Cherokee County in the late 1930s and 1940s. Glad attended Stephens College in Columbia, Missouri, and later studied music with eminent teacher and composer Tibor Serly in New York. 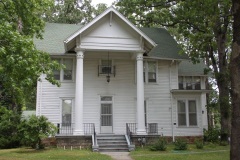 She wrote over 250 songs and choral works – many from the music room on the first floor of this house in Baxter Springs. The house was nominated for its local significance in the areas of Commerce, Performing Arts, and Politics/Government.